A statement recently released by TVS said that its Jupiter scooter has sold more than five lakh units in less than 18 months, a record in the Indian scooter industry. 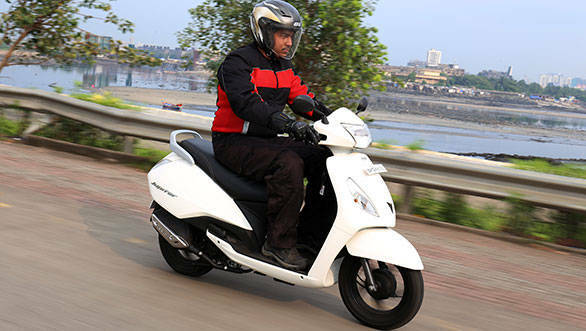 TVS says that their scooter is the most awarded one ever in India and to commemorate this feat, had launched the Jupiter in a special limited edition version and with two. The TVS Jupiter has a metal body and has a conservative styling which is intended at a male rider. TVS says this has worked for them, helping make a dent in the sales of the very popular Honda Activa. The TVS Jupiter is powered by a 109.7cc engine which puts out 8PS @7500 rpm of power and and 8Nm at 5500 rpm of torque. The company claims a fuel efficiency of 62 kmpl. K N Radhakrishnan, president and CEO of TVS said, "A lot of thought and customer insights went into the making of TVS Jupiter. The fact that we have crossed this landmark in record time is testament to the fact that consumers are happy with the product's performance and quality. It will be our continued focus to delight our customers with consistent product innovation and introduction of freshness into the brand"
Yamaha have recently launched their new 113cc Fascino and it will be interesting to see how the competition turns out.